Should you prepay property taxes for 2018? WASHINGTON — With encouragement from top elected officials, many homeowners around the country have rushed to prepay their 2018 property taxes in order to claim deductions that will be capped under the new tax law. But the IRS has said, in effect, not so fast, while tax experts warn that filers should be careful to make sure they aren't creating new problems for themselves. The prepayment frenzy is a response to the newly signed Tax Cuts and Jobs Act, which doubles the standard deduction and allows filers to write off only $10,000 in combined state and local taxes. While the legislation bars people from prepaying certain taxes to avoid the limits for one more year, it is silent on property taxes. As a result,taxpayers are lining up to get their 2018 tax bill paid early, in order to maximize their deduction one final time before the new rules take effect. Only 28 percent of tax filers take the state and local deduction at all, according to the most recent data compiled by the nonpartisan Tax Foundation. That limits the universe of potential prepayment beneficiaries to mostly upper-middle-class and wealthy homeowners who have enough savings to pay the tax in advance. Governors in some states with high property values, incomes, and taxes whose residents are more likely to be affected, like New York and New Jersey, have ordered local governments to accept partial or full prepayments. "It's a scramble," Gov. Andrew Cuomo, D-N.Y., said on MSNBC Thursday. "This is what happens when Washington passes a bill in the dead of night, and doesn't vet it with the public." But there are limits to who can benefit. The IRS issued a memo on Wednesday night advising taxpayers that they can pay property taxes for 2018, but only if those taxes were already assessed in 2017. That means people who estimated their 2018 tax bill themselves and sent out a check early won't be able to claim a deduction. It only counts if they've been handed a specific bill by their state or local government (or can find that bill on the government web site). "You can't pay three years of taxes now and get a super-deduction any more than you can pay 2018 taxes if you haven't had an assessment," Mark Steber, chief tax officer at Jackson Hewitt Tax Service, told NBC News. It's not entirely clear yet whether last-second efforts like Cuomo's, which explicitly authorize prepayments, will pass muster as an assessment under the new guidelines. The legal issues could spill over well into next year. "It certainly doesn't meet the vanilla definition of 'assessment,' but I'm not saying it doesn't work either," Steber said. "It's kind of new territory." Assessing property is a complicated process and the timing varies significantly from state to state and locality to locality. In states like Iowa, where property taxes are assessed well in advance, residents might benefit under the IRS guidelines and local reports suggest many are taking advantage. But in other states and counties with a later assessment schedule, or that do not accept prepaid taxes, taxpayers might be injecting their returns with needless confusion. "The answer is really going to depend on the local government," said Nicole Kaeding, an economist at the Tax Foundation, a tax policy think tank. "It's quite common for property taxes not to align with the calendar year, so it is possible an individual has a tax bill for 2018 already." Every expert interviewed stressed the importance of checking with their tax adviser before making a decision on prepayment. In addition to variation in which places qualify, there are potential downsides to prepaying, as well. Some taxpayers who pile on prepaid taxes might trigger the alternative minimum tax, which would wipe out their state and local deductions. As a result, they might be better off paying their property tax bill in 2018 even with the new limits on deductions. 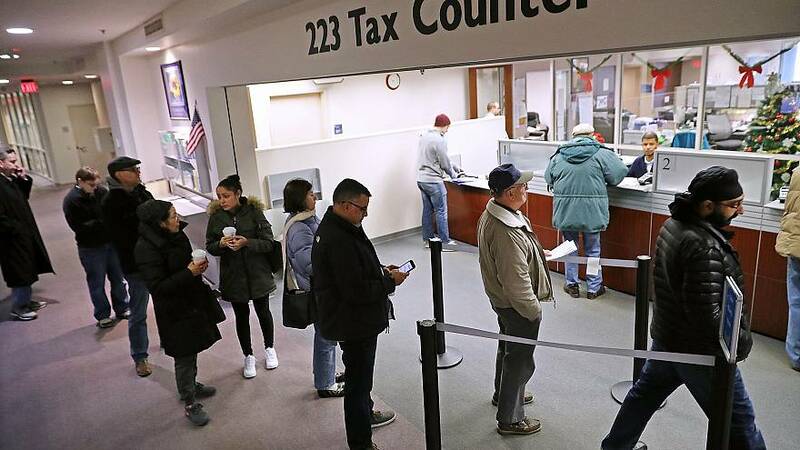 "It's possible somebody could be worse off, and there's so many tax filers that it's likely some people will shoot themselves in the foot," said Andy Grewal, a law professor at the University of Iowa. Grewal added that homeowners who pay their property taxes into an escrow account could set off red flags with the IRS, since their bank will report that they had a different property tax than the one they paid on their return. "The explanation would be that you prepaid, but most people don't like to even get an automated letter from the IRS," Grewal said.